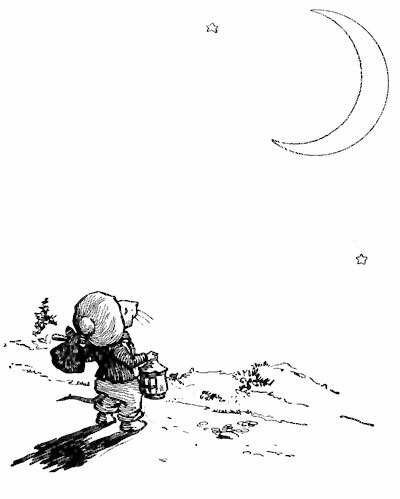 Willie Mouse had often heard his Ma and Pa say that the moon was made of green cheese, and one evening he thought he would see if he could find it. 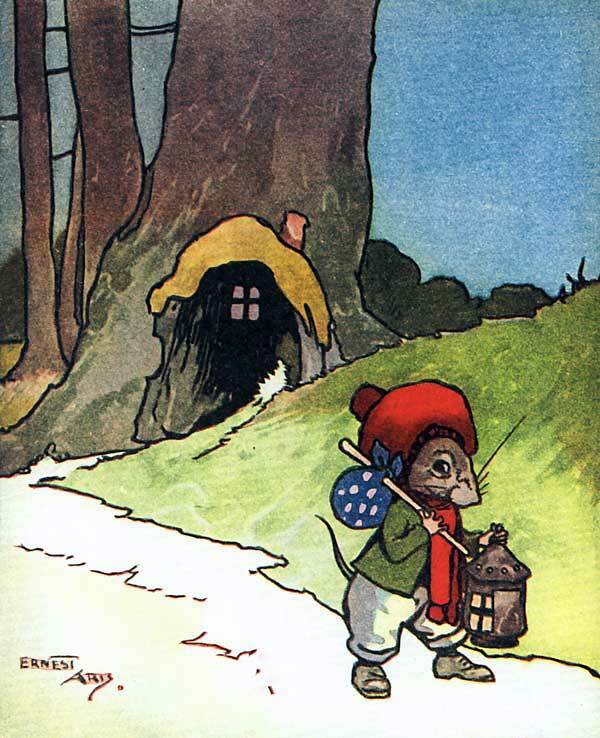 He packed up a piece of cheese and a crust of bread, and, taking his lantern, set out on his travels. 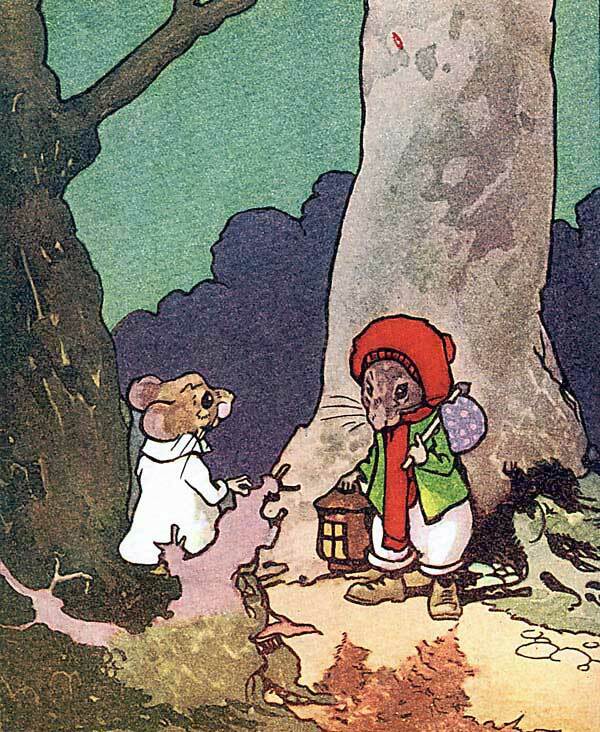 He had not gone far when he met his friend, Mr. Woodmouse, who asked him where he was going. 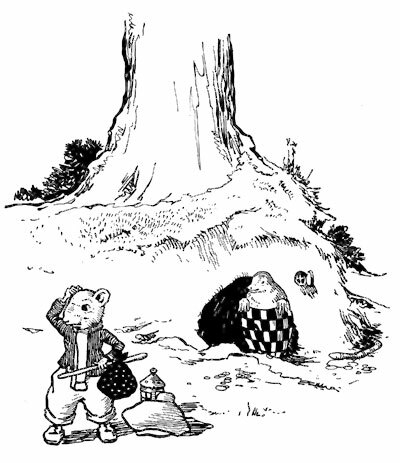 “I don't believe it's made of green cheese at all,” said Mr. Woodmouse, but Willie wouldn't listen to him and went on his way. 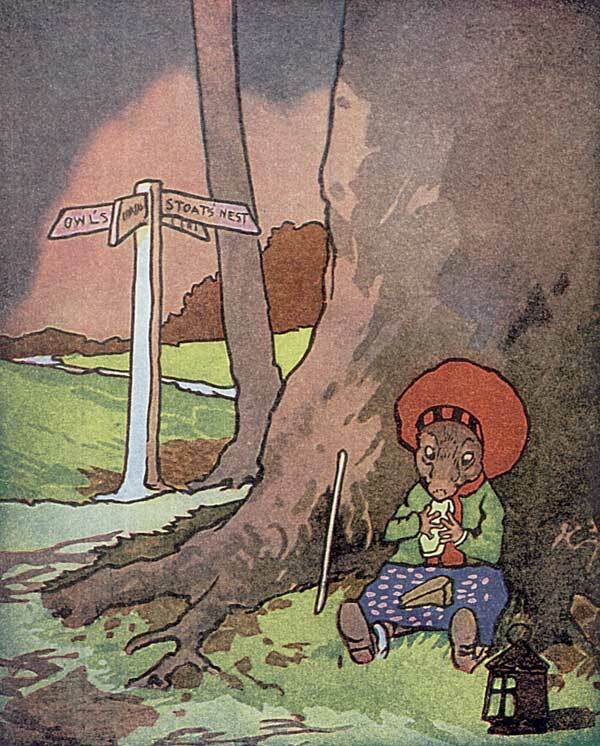 Coming round by Clover Green whom should he meet but Miss Jenny Wren, looking very gay in her yellow bonnet. “Where are you off to?” she asked. 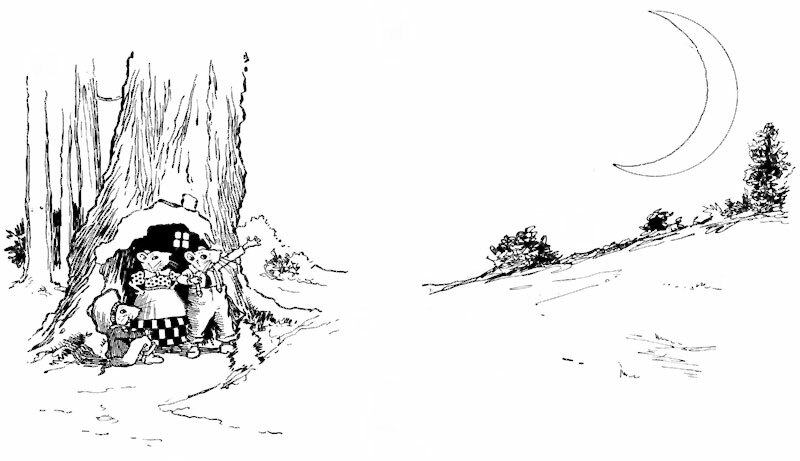 “Well,” said Willie, “why should it be made of green cheese if you can't reach it?” And on he went. 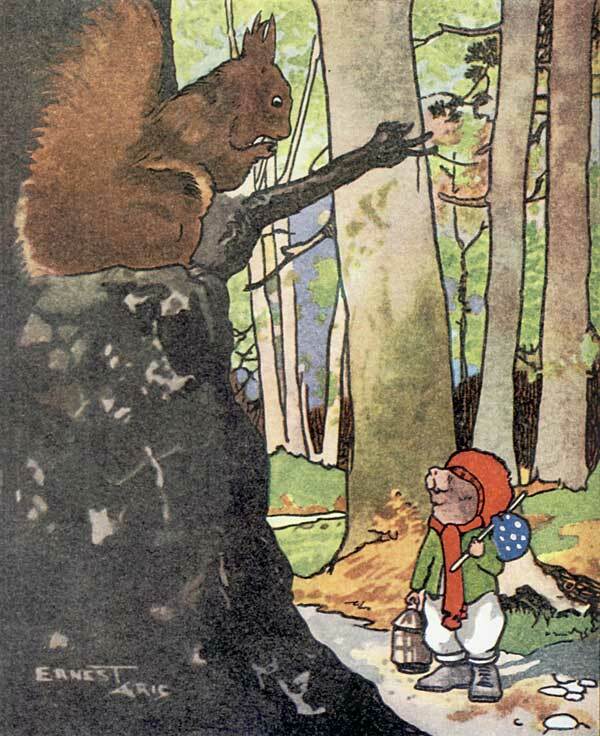 Presently he came up to a wood, and looking up he saw Mr. Squirrel jumping from branch to branch. 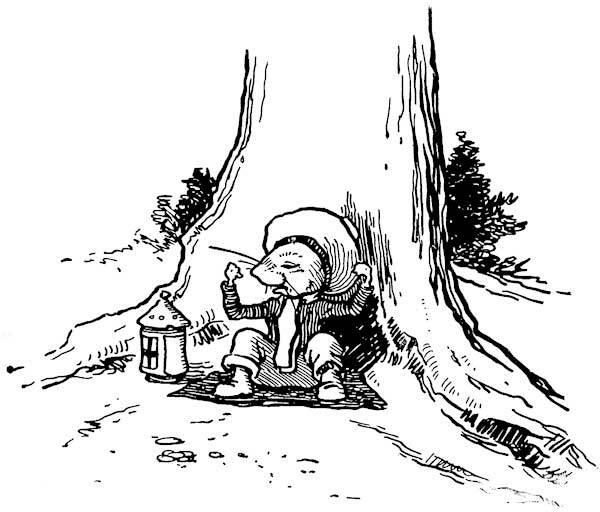 “How ignorant everybody is,” said Willie Mouse to himself. 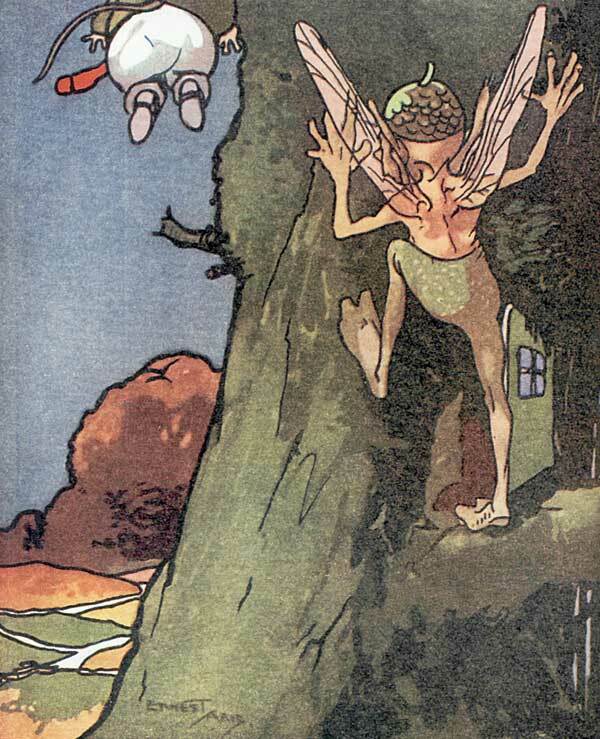 So on he went once more until he came to a little hole in the ground, and being very curious he peeped inside. 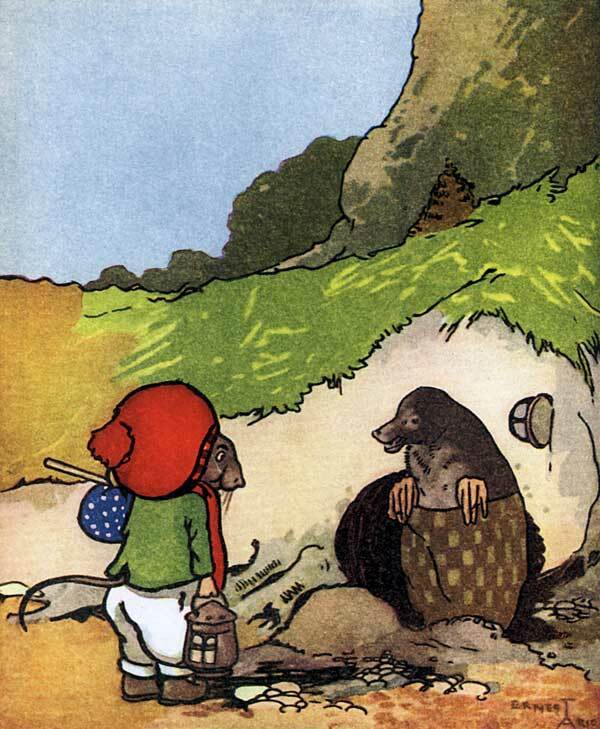 There sat Mrs. Mole, who came out when she saw him. “Do you live down there?” asked Willie politely. 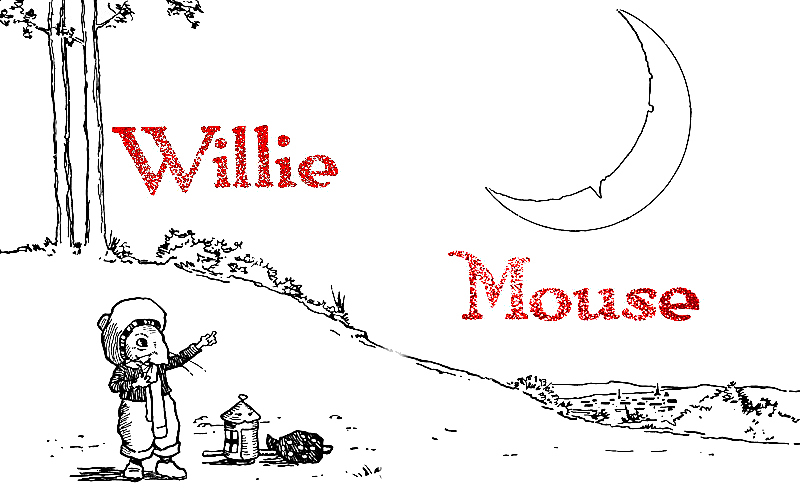 Willie said “Good-bye” to Mrs. Mole. Then he sat down and opened his parcel because it was getting late and he thought he had better have some dinner. 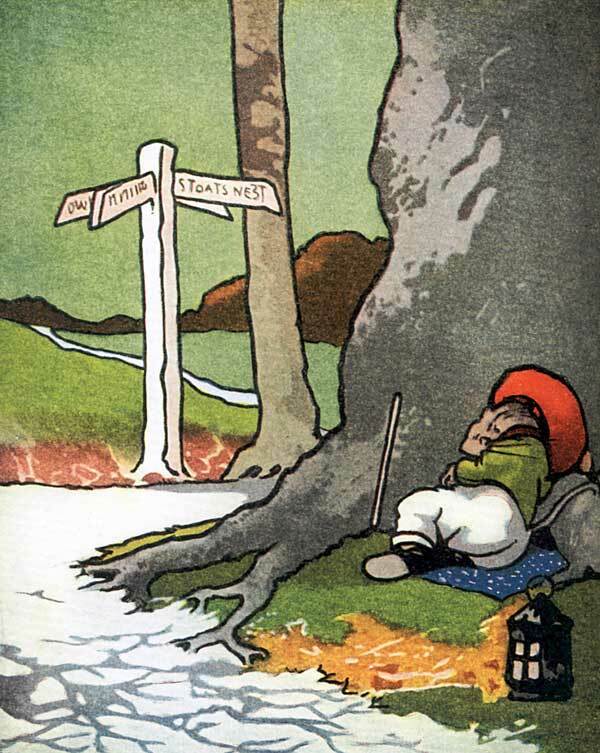 After dinner he fell asleep, and on waking he found that it was quite dark. 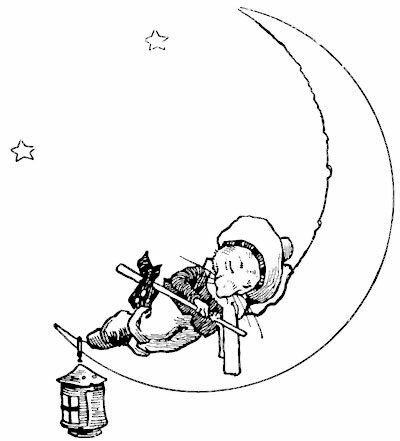 He looked up and there was the moon right high up in the sky. But Mr. Moon stayed where he was. 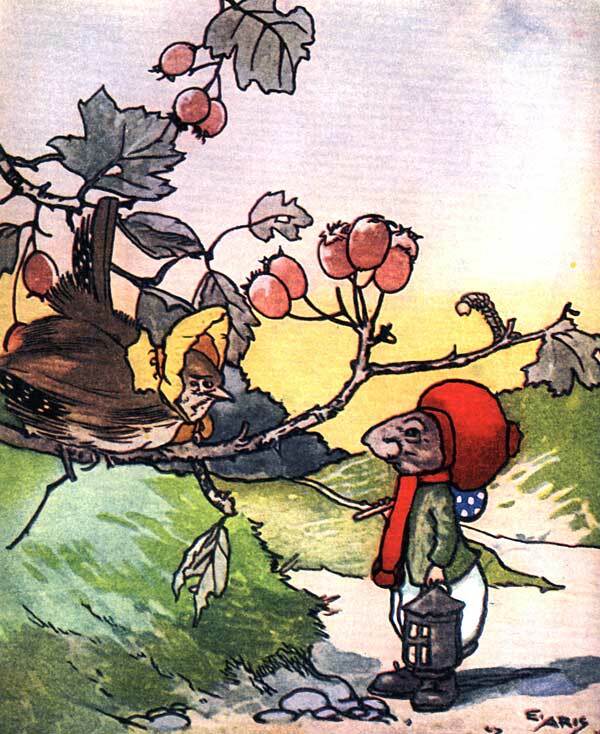 Looking up Willie Mouse saw two big eyes gleaming in the dark. 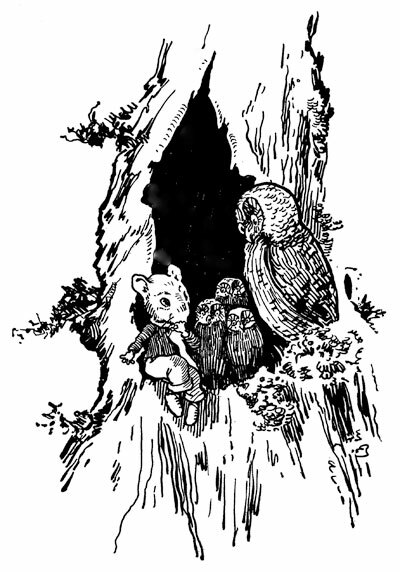 They belonged to Mrs. Owl, and as Willie was only a little mouse he didn't know that Mrs. Owl had a special liking for little mice. 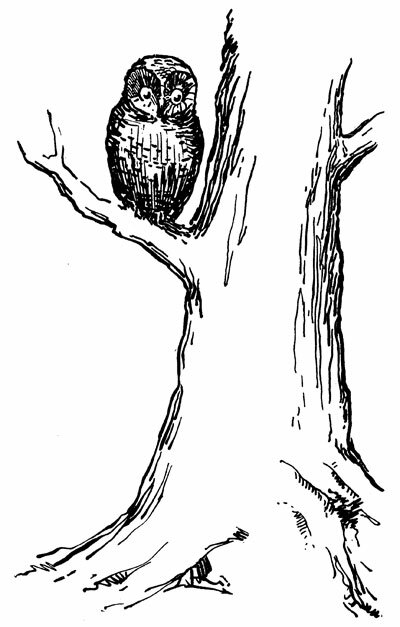 Down flew Mrs. Owl. 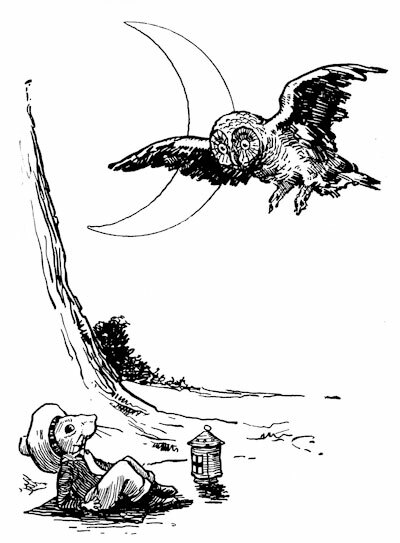 “This is the way to the moon,” she said, and she caught him up in her beak and carried him back to the owl house where she lived. 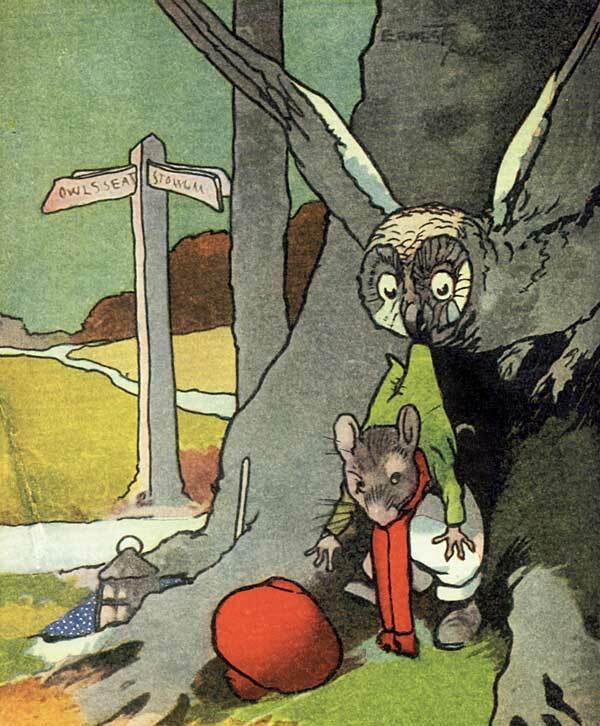 When Willie Mouse saw all the owlets with their beaks gaping open he began to be frightened, for he feared that Mrs. Owl was going to eat him all up. 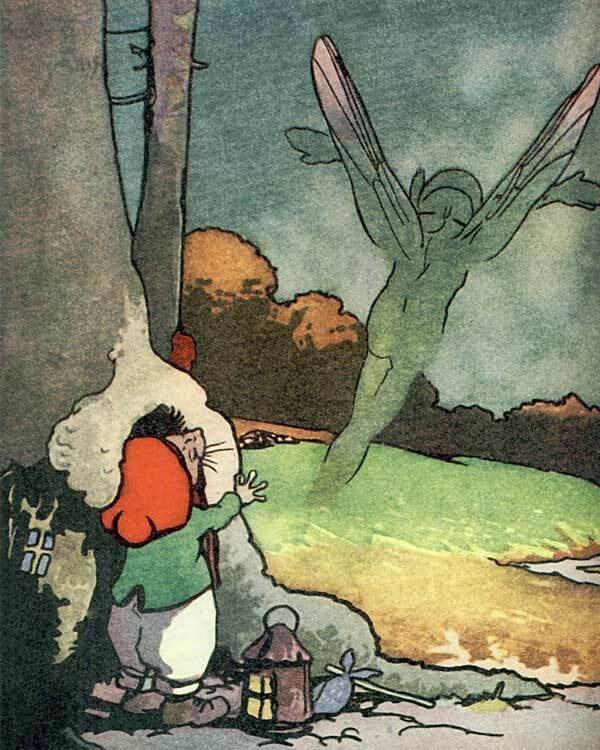 But he didn't know that a good green elf, who lived in the trunk of the tree, was near at hand, and just as Mrs. Owl opened her beak the leaves rustled and there stood Mr. Elf, who jumped to the ground with Willie on his back. 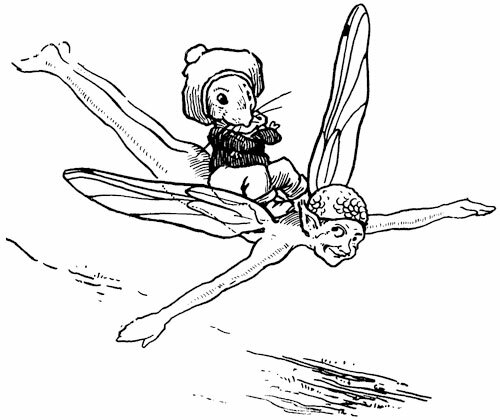 When the good green elf had shown him the way home he thought he would ask him if the moon were really made of green cheese, but all of a sudden Mr. Elf disappeared, and Willie Mouse still thinks that one day he will find the moon and have enough cheese to last him all his life. 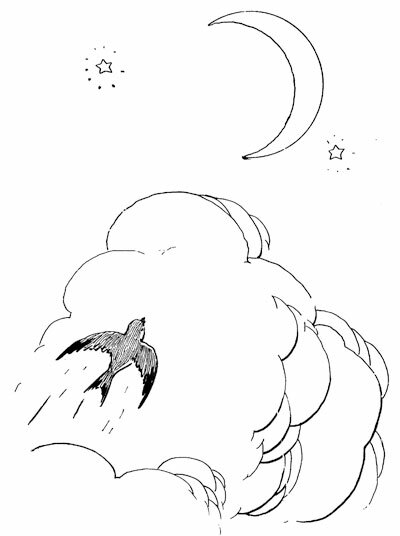 But he will wait until he is a little older and bigger before he tries to jump to the moon. And perhaps by that time he may be wiser, too.